In 32 days Children’s Friend will host its annual Walk for Children. This will be the ninth year that I’m attending, and more importantly, help raise money for the kids and families served by Children’s Friend. When we kicked off the event among staff I was asked to pose for the picture in this post. 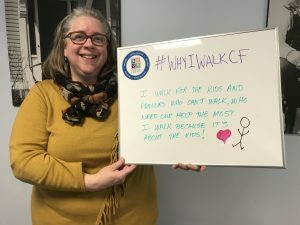 In fact, I was asked to think about #WhyIWalkCF. It came to me immediately: I walk for the kids and families who are most in need; who are not able to walk for themselves! This past weekend though I had the chance to think a bit deeper about my answer. I participated in training to learn about advocacy. Specifically, advocating for children in kinship foster care in Rhode Island. Kinship care is described as “the full-time care, nurturing, and protection provided to a child by a relative or family friend.” Most of the time kinship arrangements are informally established — the result of a temporary situation or request made by a parent. And, sometimes, the arrangement is made as a result of a child being removed from their home by DCYF. Placing children with family members or family friends rather than in homes where they don’t know anyone, can help to limit an already traumatic time for a child. My husband and I provided kinship care several years ago for three young relatives. We thought they would be here for only a few months over the summer. Three months turned into 16 months before we knew it. Because I was working at Children’s Friend I had ideas about where I could go for resources to help. I had coworkers I could ask for advice and direction; and family who offered us their time, talent, and treasure. I know that we had more support than most kinship providers, and I know, now, there was probably even more we could have accessed. At the training I met grandparents who were caring for grandchildren. They are trying their best to get the resources that would go a long way to provide the basics their grandchildren need. They are doing all this in a child welfare system that is, sometimes, unresponsive to the kinship families it is supposed to serve and the children it is intended to support. So, if you ask me again #WhyIWalkCF, I’ll tell you it’s for the grandparents and #RIKinship4Kids!